Despites of countless efforts and money, Mr Dinesh Thapa could not save his wife from illness. After being parted away from an intimate friend of his, he was all heartbroken and did not know what to do next. He sold all of his earnings and properties including La’ Pizzaria restaurant and everything that he earned in 11 years of his professional career. One day he was just staring at the road thinking about the loved ones he lost, he saw a guy get beaten up pretty bad by group of other guys. When he went to rescue him, everyone ran but he was walking slowly pretending as if he heard nothing. Mr. Dinesh Thapa shouted loudly but still there was no reaction from him. After he was confronted, Mr. Dinesh found that the boy couldn’t hear a word. He fled the scene and Mr. Dinesh was unable to help him and felt guilty. After some days, he found a group of people gathering around a dead body near the Lake and got curious. He was heartbroken to have found that the dead body was of the boy whom he tried to rescue days ago. He felt broken from the inside and wished he could have helped him with whatever he could. His eyes lled with tears of guilt. Apart from that, he was still devastated from the loss of his loved one not long ago. He thought about million different things for some time and nally came to a conclusion. The conclusion was that he had decided to open a modern business venture that fully supported differently abled persons. He dreamt of making them as able as anyone will be in days to come. 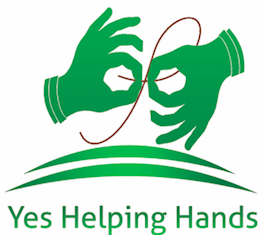 He incepted “Yes Helping Hands” enterprise and hired 27 people with hearing issues and 5 blind people. He trained them day and night hiring trainers and professionals and made them equally able. He grew the number of person working for handicrafts and pashminas in his enterprise. He supported their family when they needed it the most and encouraged everyone to live life normally and happily by outcome of their own hard work. with speaking and hearing issues. He thought salary was not enough, so he built a canteen and dorm for everyone working so that they could save up everything they earned with their hard and skilled efforts.